Due to their unusual virulence in humans, H5 and H7 avian influenza viruses rightfully garner much of the attention of pandemic planners. We can take some solace, however, from the knowledge that - at least over 100 years we can identify pandemic strains - all have come from the H1, H2, and H3 subtypes (Are Influenza Pandemic Viruses Members Of An Exclusive Club?). While recent history doesn't preclude our seeing an avian flu pandemic, swine - which are susceptible to a wide variety of H1, H2, and H3 influenza viruses, and are physiologically much closer to humans (if that bothers you, think how the pig feels) - may be a much more likely source of pandemic flu viruses. Which is precisely the host the 2009 H1N1 pandemic virus - a triple-reassortment of swine, human, and avian flu viruses - used during its lengthy evolutionary trek towards gaining its ability transmit readily among humans. Pigs are viewed as potential `mixing vessels' for influenza viruses, due to having both mammalian α2,6 receptor cells and avian-like α2,6 receptor cells, and having frequent contact with humans and birds. The 2009 H1N1 pandemic virus, which leapt from pigs to humans in Mexico, subsequently turned up in pig herds around the world, undoubtedly carried to them by infected humans. 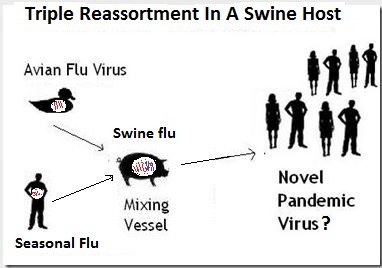 This evolutionary feedback loop (reverse zoonosis) has enabled many new swine flu combinations to emerge. Over the past 10 years we've seen roughly 400 human infections with swine variant viruses reported in the United States, with the H3N2v strain the most common (94%). Last August, over a period of several weeks 18 people - all fair attendees - were diagnosed with swine-variant H3N2v in two states; Michigan and Ohio. In October the MMWR: Investigation Into H3N2v Outbreak In Ohio & Michigan - Summer 2016 revealed that 16 of the 18 cases analyzed belonged to a new genotype not previously detected in humans. Eurosurveillance: Severe acute respiratory infection caused by swine influenza virus in a child). Which brings us to a new, open-access report - in the journal Influenza and Other Respiratory Viruses - of the establishment of a new H3 triple reassortant influenza A virus in Danish pigs. Particularly intriguing is the `reappearance' of an H3 gene that hadn't been seen in any host for nearly a decade. The full report is well worth reading, and underscores how much viral evolution goes on in swine herds around the world, mostly without our knowledge. This report describes a triple-reassortant influenza A virus with a HA that resembles H3 of human seasonal influenza from 2004 to 2005, N2 from influenza A virus already established in swine, and the internal gene cassette from A(H1N1)pdm09 has spread in Danish pig herds. The virus has been detected in several Danish pig herds during the last 2-3 years and may possess a challenge for human as well as animal health. We report here the detection of a new triple-reassortant H3N2 influenza virus in swine with H3 gene of seasonal human influenza virus origin, internal genes from A(H1N1)pdm09-like viruses, and NA from contemporary N2 swine viruses. Its genetic makeup is distinct from previously known European swine H3N2 viruses, and the virus was retrospectively detected in a sample from 2013. It is now apparent that the subtype has become established in the Danish pig population. The reservoir of this virus during the period from 2004 to 2005 human influenza season until 2013 can only be speculated, as it has been reported neither in the human nor in any animal populations during that period. Therefore, further molecular clock analysis is needed on more isolates to elucidate when this virus emerged, and to confirm that the parent virus is indeed from the 2004 to 2005 human influenza season. The reassortment events leading to this virus also remain speculative. If the H3 gene indeed originated from the human seasonal influenza strains circulating in 2004/2005, this H3 gene have circulated undetected in swine or another host for more than 10 years, and until the emergence of A(H1N1)pdm09, this must have been without the internal genes derived thereof. In our view, a likely scenario is that the H3 gene reassorted with a swine influenza strain with an HXN2-avian-like backbone creating a virus that did not cause severe clinical signs. As there was no link between the two independent production systems, the introductions either happened independently from a third source or by transmission between the production systems by other horizontal routes, for example, airborne transmission. The human-like swine H3N2 virus is distinct from the strains included in all available swine vaccines in Europe and, furthermore, the prevalence of viruses in swine with an H3 gene is very low in pigs in most European countries including Denmark. 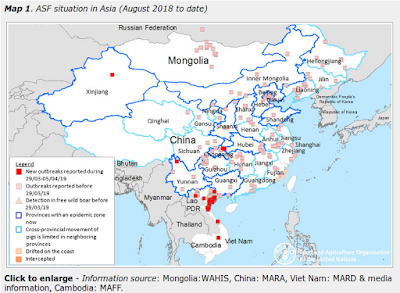 Thus, the establishment of this new H3N2 virus in pigs could have a significant impact on the swine industry due to lack of population immunity. Indeed, the respiratory disease in pigs and reproductive failures in sows reported from some of the herds in this study were quite severe despite vaccination of the sows. According to the practitioners we have had contact with, the clinical sigs seen in the herds are comparable to or even more severe than the clinical signs normally encountered during acute outbreak of influenza in Danish swine, so this virus seems to be as virulent or even more virulent than the enzootic circulating strains. Further controlled studies are needed to address this further. The identification of this new virus with seven of eight genes of human origin including an A(H1N1)pdm09 matrix gene also raises severe concern on the impact on human health. In the United States, swine-adapted H3N2 viruses which also have acquired the A(H1N1)pdm09 matrix gene have been shown to be able to infect humans, albeit with limited human-to-human transmission. The new virus reported here has in addition to the A(H1N1)pdm09 matrix gene also a human-adapted HA gene which may lead to an improved risk of human-to-human transmission if introduced into humans. Studies are ongoing to investigate these further using ferrets as infection models.